HOM and MICECC leaders work closely together to determine ministry needs and priorities. We invite everyone to join us in ministering to the needs of people of Haiti. There are many opportunities for teams and individuals to partner with us in the areas of ministry, education, healthcare and construction. Click here for more information on our most current needs and a list of available projects. Evangelism ministries provide individuals the unforgettable experience of directly serving and ministering to “the least of these among us.” Join us in one of our ministry programs in Haiti! 1. Vacation Bible School. There is a great need throughout the summer months for teams to host week-long VBS at one of our churches. Bring the Bible to life through skits, storytelling, crafts and scripture memory. If you love spending time with kids and want to spread the Gospel to the children of Haiti, this is for you! 2. Leadership Training. Develop or lead programs designed to help congregations, pastors, and other church leaders effectively work together to accomplish God’s mission. 3. Pastor retreat. Support our pastors and church leaders by providing funds for them to attend seminars and classes designed to renew and support their spiritual well-being. Teams are asked to provide all supplies necessary for their area of ministry support. VBS materials include snacks, arts and craft supplies etc. and continuing ministry education will require the necessary literature for classes and workshops. 2. Reading Programs: Help children enjoy a wonderful world of learning and exploration through reading. Creole and French books at all age levels are needed. Contact us at info@Haitiom.org for more information about donating books for our schools. 3. Teacher training sessions: Assist our teaching staff in Haiti with ideas that can be implemented in our classrooms. 4. Enrichment Programs (art, music, etc. ): Students enjoy being able to experience and participate in new things. Donate art and craft supplies, musical instruments and sports equipment to provide opportunities for children to learn and express themselves through different mediums. 5. Sponsorship Program: Give students an opportunity to receive quality academic instruction in a Christian environment. Consider sponsoring a primary, secondary or trade school student – go to the Sponsorship page for detailed information about our programs and how to sponsor a student. The vast majority of the Haitian people still struggle to access the health care they need. There is no adequate system in place to provide needed medical and dental care. Our MICECC medical staff serves the Cite Soleil communities while their efforts are supplemented by visiting medical and dental teams. 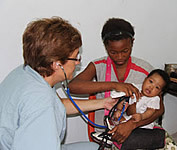 Share the love of Jesus by providing quality health care to the underserved people of Haiti. 3. Vision and eye care: Opportunities are available for teams to provide vision care and reading glasses. Ophthalmologists are needed to provide more comprehensive eye care. 4. Mental Health: Psychiatrists and related mental health specialists are needed to provide counseling and teach strategies to improve common mental health issues. 5. MICECC clinic support: Funding is needed for staff salaries and to purchase needed drugs and supplies. Consider making a monthly donation or “sponsor” one of our clinic staff. Health care professionals with specialized skills are needed to provide In-services and education/training classes to the MICEC staff. 6. Clinic Equipment donation: We gratefully accept donations of new or gently used medical equipment. See our wish list for items needed. 1. Property construction: These projects are supervised by our construction project manager and chief engineer and include construction of our churches, the new school classrooms, our clinic buildings and additions and improvements to existing structures. Teams rarely see the completion of projects in a week’s time but contribute as partners to ongoing major projects. 3. Community projects involve working on homes in the church communities. This can include installing a new roof, painting a home or building a new home for a family in need. See our “Project list” for specific projects where help is needed. Teams are asked to provide funds to cover the cost of project materials.